About ninety minutes west of Ashville, North Carolina, set in the midst of the Great Smokey Mountains, rests Nantahala, a quaint little town known as Land of the Noonday Sun. A beautiful backdrop with waterfalls, forests, whitewater, romance, passion, family secrets, betrayal, and murder... Well, in my stories anyway. 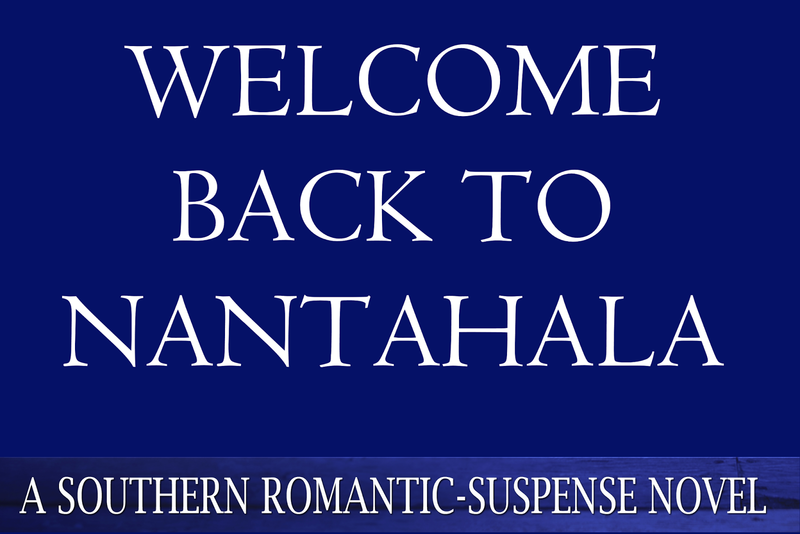 If you've read any of the books in the southern romantic-suspense collection, you'll know that each novel is a stand-alone story that can be read on its own--no cliffhangers! But, I pull supporting characters who have proven their worth to star as protagonists in the follow-up stories. If you've read Land of the Noonday Sun and When Noonday Ends, you'll know that one of those characters was set with a choice at the end of the last novel. And as always, I left it to my avid-reading friends to let me know if they wanted to read her story. I'm happy to say there was a resounding YES! So for those of you who've been waiting to see who she chose, welcome to the first excerpt in the next Nantahala Book. Michelle Turner allowed her gaze to wander over her two would-be suitors. Both men were about the same height, just slightly taller than her five-nine, but that was where the similarities ended. Andy Montgomery, relation to one of the most powerful and wealthy families in North Carolina, looked like a prince out of one of the fairy tales she read to her fifteen-month-old daughter every night. With platinum-blond hair, eyes as blue as the North Carolina sky in the summer time, and a narrow face with a strong chin, she could almost imagine him whisking her back to his palace on his white stallion. Jason Bearns’ rounder, more boy-like features, even though he was nowhere near a young innocent boy, matched his strength and his mood most of the time: dark. Most women might not understand his dark demeanor, but she did. And admittedly, she liked it. His hair was the color of chestnuts and his brooding, deep-brown eyes, the color of melted chocolate. She was pretty sure she could stare into his eyes forever and never learn all his secrets. Then again, he’d never insist on knowing all of her secrets either. God help her, she never thought she’d be in the predicament of choosing between two men. But here the two men stood, waiting for her. She’d been alone for the last couple of years, but now both men looked sharp in their black tuxedos and were such gentlemen that neither would step up to the plate. How could she possibly choose between the two men? As much as Andy’s classic good looks and headstrong demeanor appealed to her, Jason was just as handsome in a rugged country boy way. And as a retired cop, now a private detective, Jason could certainly understand her and her previous life as a Marine. Not many men were comfortable with a woman who could kill a man with her bare hands. Then again, Andy had taken down her brother with one punch, and had been willing to go to jail to protect his sister. That spoke of loyalty. Of course, Jason had also protected Andy and his sister, her new sister-in-law, by taking out the two people who’d tried to murder them. Either of her suitors would be a great father to her daughter and would protect her and her family unto death. Unable to decide, she stood her ground, smiling at both men, hoping one of them would forget to be a gentleman for a moment and make the decision for her. As if on autopilot, she tilted her head as a new man approached, weaving his way through the round tables that were set around the room of her brother’s wedding. Oblivious to her predicament, the man’s familiar eyes focused on her. His bright blue eyes set against olive skin seemed to dance in the shimmering candlelight in the ballroom of the Biltmore Estate. If it weren’t for the fact that he looked so much like her ex-boyfriend, Chad, she never would have recognized him. As it was, she couldn’t even remember his name. It’d only been a few hours...a few hours that had changed her life forever. Smiling, he walked right between Andy and Jason and took her hand, leading her to the dance floor. Michelle thought about protesting, but her words froze in her mouth as she watched the staggered expressions of Andy and Bearns turn to dark suspicion. Serves them both right. One of them should have manned-up. She bit down on her lip as she attempted to hide the emotion bubbling just below the surface. Yes, the man she’d had a one-night stand with a little more than two years ago looked like Chad, but he was nothing like her ex-boyfriend. Their day—and night—together rushed to her senses. He’d staked his claim from the moment she’d stepped into the whitewater raft. He’d looked at all his friends, then had lowered his head with a quick nod. She’d laughed at first. She’d hung out with enough of her Marine Corps brothers to know the deal. The first to claim the girl, won. And she’d played along… all night. She’d be upset about her actions, which she had in the beginning. But she could never be upset about the consequence of her decision. Why couldn’t she remember his name? Think, Michelle. You held your own. You knew what you were doing. The good-looking man who held Michelle in a light embrace stared at her dark-haired, blue-eyed little girl, then back at Michelle. He couldn’t miss the fact that her little girl was as dark-haired and blue eyed as he was, whereas Michelle had blond hair and hazel eyes. “You wanna run now?” she whispered. “I’m not…prin…cess,” her daughter said through a giggle, “I’m Sam.” She batted her little eyelashes, then hid her face against her grandfather’s arm as he twirled her on the dance floor. Nicolaus… Nick, he’d told her to call him, Michelle now remembered. Her daughter peeked up and nodded. Michelle gritted her teeth together as her father narrowed his brow, probably wondering why she’d let a total stranger dance with his granddaughter. He had to recognize the resemblance. The rumors that her baby was Chad’s must have even convinced her parents, even though she’d sworn to her father and mother repeatedly that it wasn’t Chad’s baby. Lie a few times and suddenly no one trusts you anymore. Michelle glanced up at the man who still held her. He was tall, close to her brother’s height of six-two, which was tall for most women. For her, he was perfect. His height, that is. Not him… He was younger than she was…she remembered that tidbit too. And he’d been moving back to New York. He’d just been a one-night stand, a stupid fling on her part to get back at Chad for taking off and marrying another woman. An indiscretion that had changed her life forever. Michelle bit her lip, nodding her answer. Michelle felt her eyes fill and her throat close. She swallowed again. Mine? What did he mean by mine? Her daughter, like her, didn’t belong to anyone. It didn’t matter. He was too young, a few years younger than she was, which made him about twenty-seven. He was looking for a reason to run, she was certain. “Okay.” He reached for her, pulling her back into his arms, tighter than before, reminding her why she hadn’t let him leave that night. The music changed to an upbeat song, so Nick escorted Michelle off the dance floor. He almost laughed at the searing gazes two men threw in his direction. The two men were as different as night and day, but clearly, they shared a common interest: Michelle. “Friends of yours,” he asked as he held out a chair for the beautiful blonde he’d worked to track down the moment he’d arrived in North Carolina. Hell, he’d been thinking about her for the last two years, but his life had been too busy. North Carolina was the perfect escape from what he’d been dealing with, though, and Michelle had been the reason he’d chosen this city. Ignoring the glares from the men, Nick sat down beside Michelle and layered his arm over the back of the chair, staking his claim, as he’d done the first time he’d seen her. If the men wanted to approach her for the next dance, fine. But he’d make them second-guess themselves. “So, Sam’s—”A tap on his shoulder had him bolting around in his seat. He really hadn’t expected either man to be so bold. “Don’t leave,” Nick tried to implore Michelle as she walked off, but Tom held onto his arm. Turner waved her off. “She’ll be fine. She likes to control men, so she’ll try right from the start to see if she can get you to grovel at her feet. Don’t let her, man. She’ll walk all over you.” Turner raised his hand, motioning to Cameron, who stood on the other side of the room, next to two tall blondes. The one woman held a small baby and the other was wearing a wedding dress, a young boy latched to her leg. Cameron kissed the woman holding the baby, then trotted across the room. “Congratulations, man.” Nick smacked his old friend on the back. “Wow…both of you have kids…” Cameron made it to the table, cutting off his words…his thoughts. He had a kid too. Wow! What a shock. He’d been looking for the woman he couldn’t stop thinking about for two years, only to find out he was a father. Why didn’t that fact bother him? Cameron and Tom both burst out in laughter. “The Death Angel maybe, sis!” Tom said. Nick flashed a quick glance at Tom and Cameron. “Me too, Nick. My bride is certainly looking for me.” Tom winked at his sister, then trotted off next to Cameron. Michelle dropped her head. “You do.” She pointed behind him. “I don’t. We’re just friends. But if you think you’re gonna walk into my life after two years and start telling me whom my daughter can see, you have another thing coming.” She pushed away from the table and stood up. The dark-haired man rested his hand on his side. “Then, I suggest you leave now.” A cop, Tom had said. Yeah, he noticed his stance and how he rested his hand on his concealed weapon. “Do you need assistance to the door?” the blond man offered. He wasn’t large, but Nick could see the muscles twitch in the man’s jaw. He was a scrapper. He’d seen his kind on the streets. Michelle leaned forward and snatched the card out of his hand, but made no effort to call off her hounds, so Nick turned and walked away. He saw Tom and Cameron, but he’d catch up with them later. He had a few business matters to take care of anyway. The last thing he needed was a scuffle and for his name to end up in the paper. He didn’t need anyone to find out he was here. I hope you enjoyed this sneak peek. If you haven't already, please sign up for my newsletter to receive notice about the next release and giveaways that I always run with every release. In fact, I'll be running a huge Christmas Giveaway starting Thanksgiving Day. You can sign up here. For more information about my other stories, visit one of the links below. I'll even give you a free book, just for stopping by.